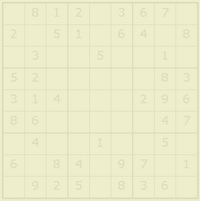 Enter a Sudoku puzzle into the grid and click Solve. Restore restores the puzzle solved before. With Save you can save any state, it can be recalled with button Recall. Reset cleans the grid. Solves even hard Sudoku puzzles with pure logic.